Just click here for more detailed info. And happy foraging! Black and gold vases, Honeycomb Studio, $35, Blush linen napkins, Celina Mancurty, $25. 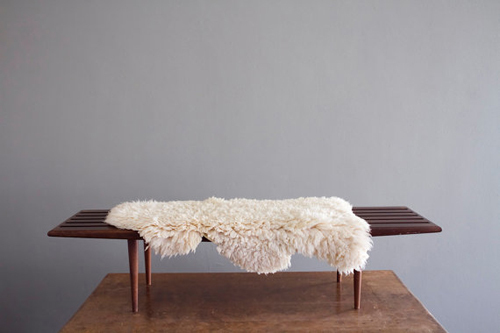 Mid-Century coffee table via The White Pepper, $440. Flower painting by Linda Monfort, $600. Alpaca wood display dish, $32. The Vintage Vogue Story; Planter Mount by Yield Design Co, $38. Linen pinafore apron, Lou Embrace, $50. Brass candlestick set, Kibster, $30. Floral candle holders, Cloth and Patina, $30. Classic and handsome, that's how I describe the pocket squares made by Kathrine Zeren of Houston, Texas. Made of organic cotton and recycled hemp, these squares can be staples in any man's top drawer. With an impeccable eye for design, Kathrine also offers an impressive selection of vintage hankies as well as her own designs. Her shop currently includes over 40 colorful vintage ones to choose from and priced at just $25 each, they make a great buy. In preparation for the unveiling of the next Sweet Peach Sweet Spots edition, I'll be posting quite a few stories on shops in Athens, Georgia. 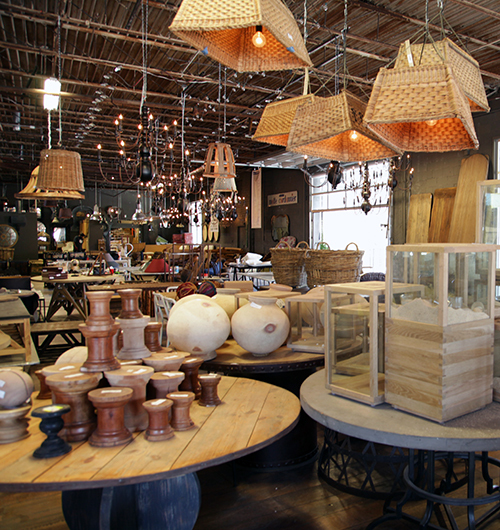 Starlite Showroom is one of my new favorites as it's full of well curated vintage finds at great prices. With a lot of vision, the pair decided to renovate an old mechanics shop and used car store they found on Broad Street. The space, with half a dozen rooms, initially was a complete mess. It took the pair three months to renovate it, tearing down paneling, rewiring the electrical, adding centralized heat and air and repainting the entire place. Luckily plumbing and contracting is something they both have done on the side and were able to do all the grunt work themselves. Subsequently, they have low rent and low overhead so they've passed on the savings to us. Their prices are much better than you'll find in many other southern cities- with the large, vintage maps starting as low as $80, the working General Electric AM tube radio is for sale at $81....the ceramics are priced to move and the lattice side table is just $174. 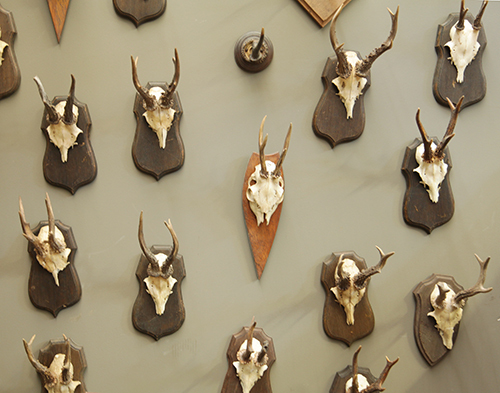 As deer and antlers remain popular sale items, you'll find a plethora of choices here. 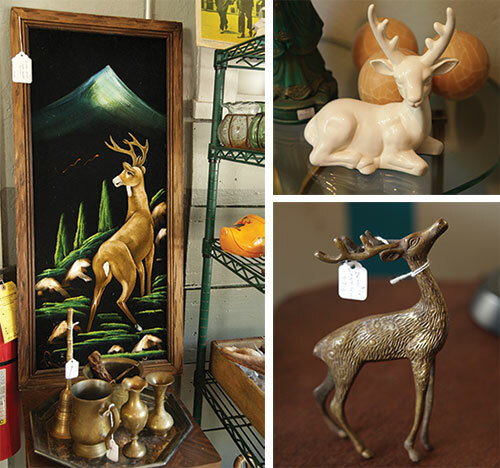 I particularly liked the large velvet deer painting for just $23. 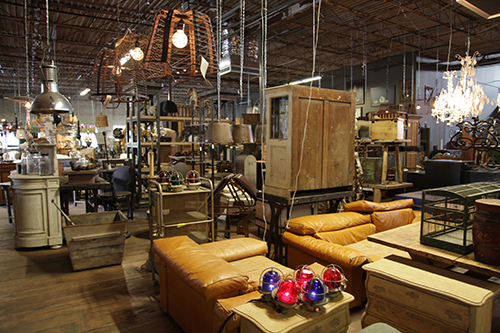 In case you missed the first giant warehouse sale, Atlanta based Bobo Intriguing Objects will be opening their doors to the public once again, this Friday and Saturday (3/27, 3/28). I got a sneak peek last week to take some pics for Sweet Peach and this sale may be even better than the last. 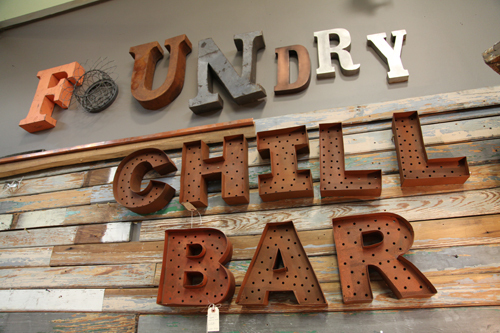 So many ridiculously good finds- like these wooden letters and numbers, sold separately at just $30 each. As they say over at Bobo, think of it as a super-luxe estate sale. Inside the 20k square foot space, you'll find wall to wall unique, cool and quirky conversation pieces- and everything is priced to move. Many items are discontinued, less than perfect, samples and one-offs. Their silver collection is designed and made by Bobo and all of the pieces are inspired by old hotel silver. 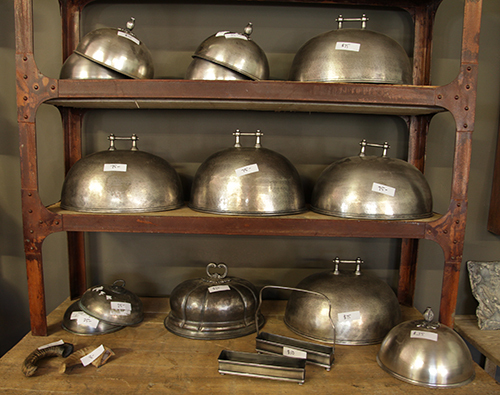 These serving domes are about as fun as serving domes get, priced well at just $85 each. Iron medicine cabinets, wooden planters made of azobe wood, natural horn desk accessories and barware collections...statues, baskets, frames, mirrors, cribs, lights, birdhouses, signs. It's never ending and the best part is each piece feels like it's one of a kind. I'm particularly excited that my good friend, Clarke Titus from Rough South Home now has his workshop situated in the back of Bobo. 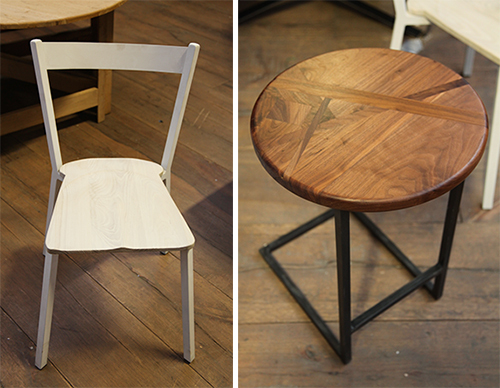 At this sale, you'll see a bit of his latest handiwork in stools, tables, benches, chairs and even some prototypes and one-offs, many at deep discounts. Don't miss this. Patrick Hayes is a dabbler. He has a lot of passions, which include music, photography, art, design, food and mixology. I first found him after a glimpse at his rustic wall art on Instagram, featuring some incredible pieces made from reclaimed wood in Nashville. After perusing Patrick's website, I learned that he also curates a must see vintage shop. As Patrick salvages wood on a regular basis, he tends to stumble upon some very interesting finds along the way. 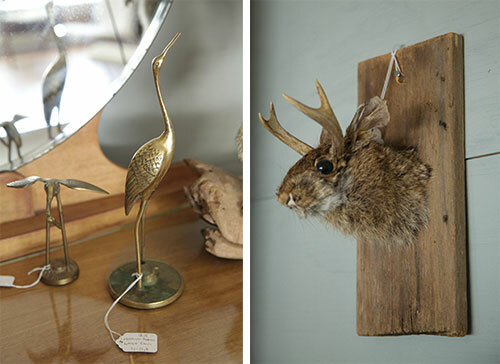 His shop includes over a 100 vintage items for the home, with each item showcasing its old age and character. Many of his found pieces have a story to tell, like this round silver boho serving tray. It was salavaged from a home in the 12 South neighborhood of Nashville, a home that was just demolished but had been standing since 1930. Personally, my favorite find of Patrick's are these mid century drawer pulls, also once a part of the 1930 home. I'd love to polish them up and place these on my own bedroom dresser. Check out Patrick's entire site, which includes his blog and artwork, here. 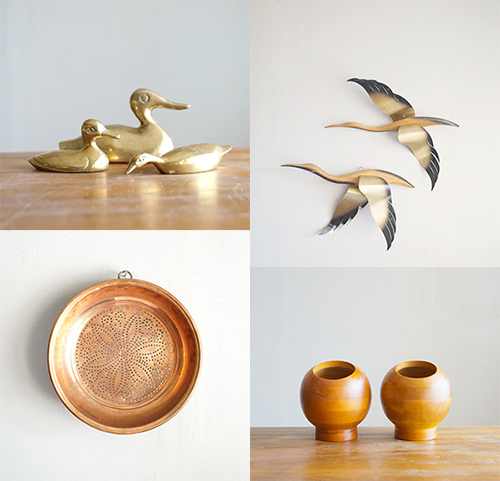 Another brass treasure are these vintage pineapple and palm tree candle holders. It's all just so good. Check out hundreds more finds just like this, here. If I encourage you to do one thing this week, let it be a visit to BoBo Intriguing Objects' first ever warehouse sale in Atlanta. Doors open this Friday, September 12 and Saturday, September 13, from 10am-6pm. Mark Sage has been in the business of buying vintage and designing antique reproductions for a couple decades now. And his massive 100k square foot, full-of-this-and-that-warehouse, proves it. He's the guy with the dream job, as he travels each month internationally to seek out the unique and unusual in remote villages of Argentina, Poland, Belgium, France, Sweden, Vietnam, India and more. 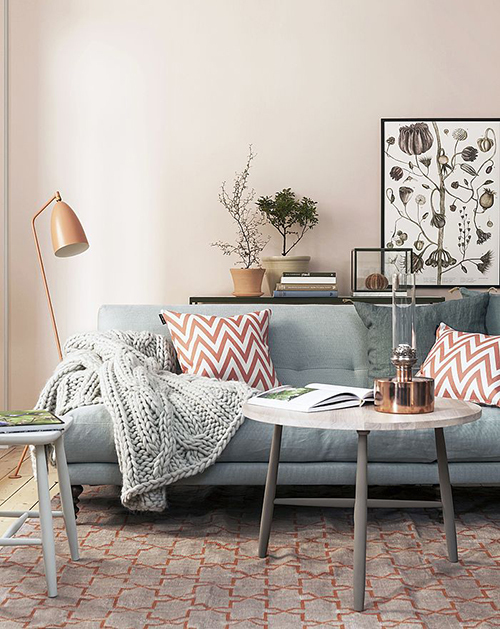 As one of the major suppliers to Restoration Hardware, Mark has over 18 fixers around the world that keep an eye out for original pieces to buy or be inspired from. With a close working relationship with dozens of factories internationally, Mark also has an infrastructure and network unlike any other. Up until this Friday, his doors have never been open to the public, only to dealers and designers. So trust me when I say, this is a real treat. 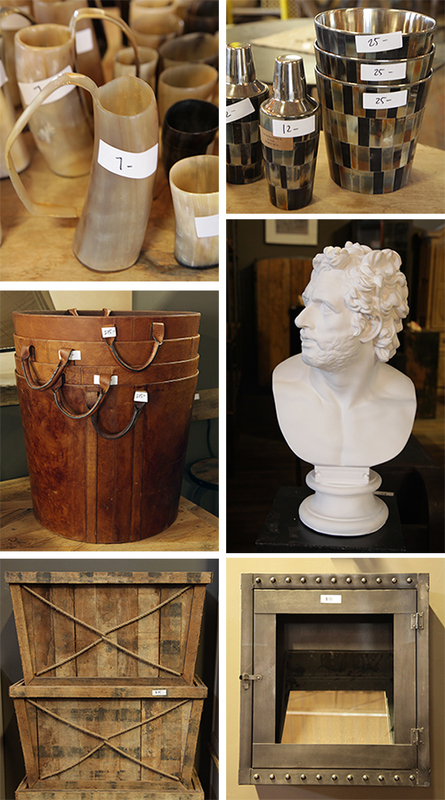 You'll find thousands of antiques here as well as antique reproductions designed by Mark. Many are one of a kind prototypes he had made but never sold. As his marketing guru, Aysan Balkhanian says, "You can find just about anything in here." 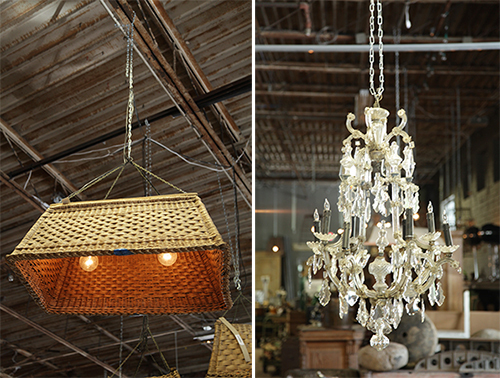 Lighting is an important part of the BoBo line and you'll see hundreds of original fixtures dangling from the ceilings. 90% of their lighting is made in Poland and materials are usually raw- like driftwood, wine barrels, metal and unfinished wood. Aysan, "Mark is the person who finds items where people say, 'Where did you even get that?' He has an eye." It's true. You can find anything in here, even Mel Gibson. There will be significant markdowns with prices ranging from a few bucks to over $10,000. Even if you don't buy a thing, it's so much fun just to peruse Mark's diverse and valuable collections, both new and old, sourced or inspired from all over the globe. His dream job turns into our dream afternoon...Here's the flyer, now go check it out! Jill Ridener of Bellalulu is a treasure hunter. 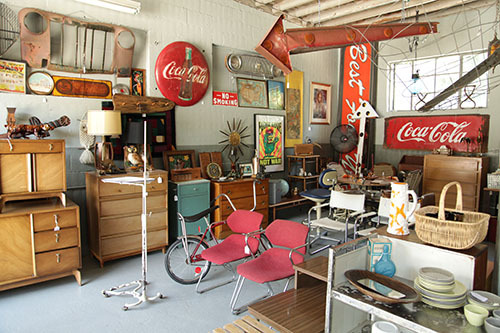 She seeks out cool finds at estate sales, yard sales, antique malls and her local Saturday flea market. She is so thorough and productive in her search that she adds one new item to her shop every day. Heidi in Huntsville, Alabama has a good eye. Curator of the vintage inspired Etsy shop, Tribute 212, she shares, "I love to hunt and gather lovingly worn objects." Katie of Pine and Main, based in North Carolina, has slowly created a vintage shop on Etsy that many others would like to emulate. 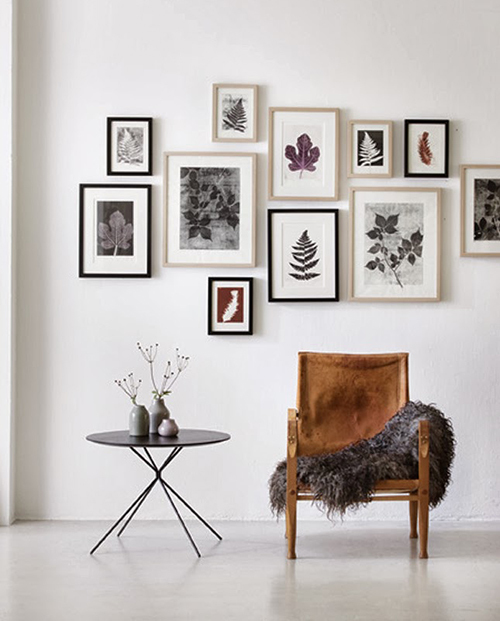 Her goods are beautifully curated, her photography spot on... I just always love to see what new finds she's unearthed for our viewing and buying pleasure. Although I'm an Atlanta girl and embrace anything vintage Coca Cola, I can't help but love this old Pepsi Cola crate. This would look great on a side porch or atop a kitchen shelf. 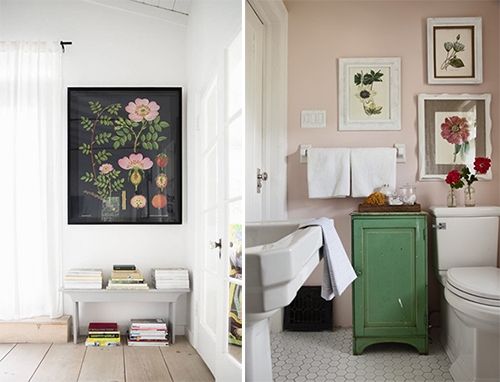 Love, love... Peruse all of Katie's finds, which are updated continuously, here. 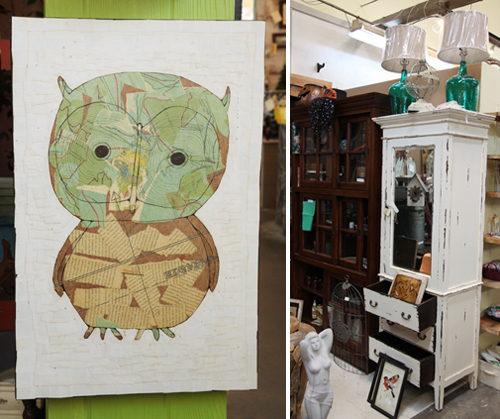 My favorite part about antique shopping is finding that unexpected piece. This set of vintage cinema seats has a multitude of uses. It works great as a bench for a hallway or entryway...even the kitchen or bedroom. It comes via the savvy ways of Rhapsody Attic, based in Atlanta. I'm a sucker for a bright colored chair with a fabric seat. This pattern is great and reminds me of growing up in the 70's. 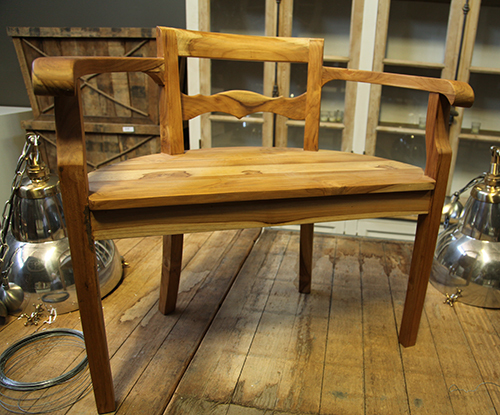 This pair of Lyre back chairs are made of mahogany wood and work great for the kitchen or patio...too sweet. This may be my favorite piece found by Rhapsody Attic, primarily becuase of its versatility. 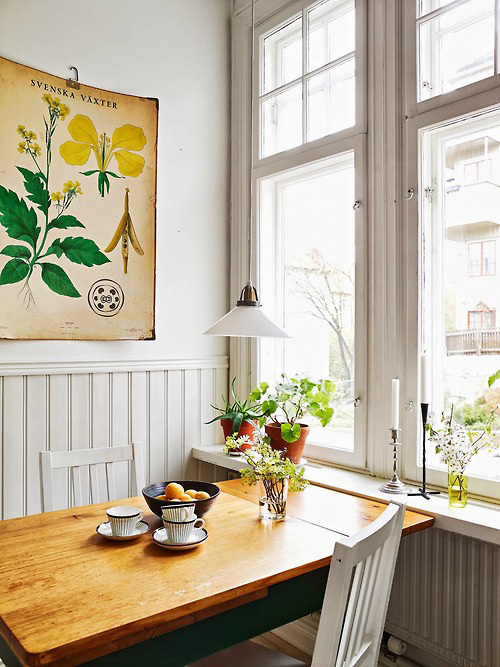 If you find the right spot for this chair, you get the added benefit of a shelf to add plants, books, fresh flowers or found objects. This would look great next to an old schoolhouse map, like this one. 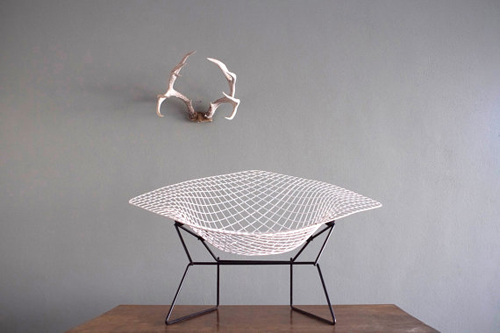 I think the folks behind Rhapsody Attic have a knack for finding great chairs. 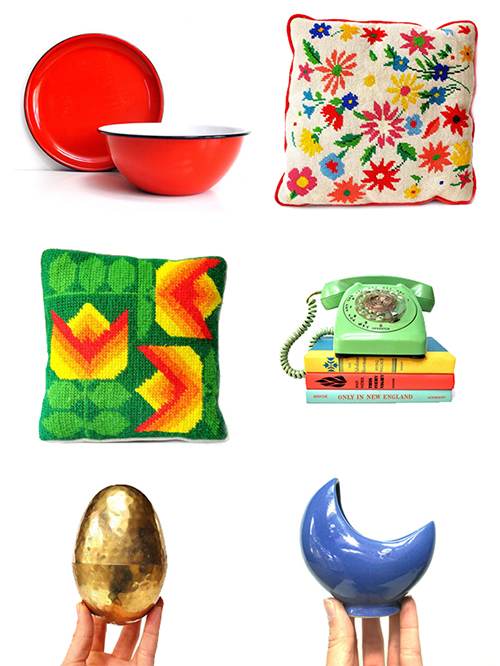 Check out more of their fabulous finds here. I apologize for no post yesterday. I'm currently working in Turkey and the internet is anything but reliable...hoping it won't have to happen again. This is the kind of shop that motivates me to get up early to go to yard sales every Saturday. Jill's finds are really incredible, like this vintage hat stand I'd love to own...and this vintage Kodak tank that would look great in a photographer's office. This handcrafted wooden cabinet with four drawers is full of character. As Jill states on her site, "lots of imperfections- chips, scratches, crackled, faded wood and paint." For this Manly Monday, I wanted to talk about what I wish all single men had in their apartment, great furniture. Even if it could be just one nice piece, it gives a woman hope. So I sought out one of my favorite Etsy shops, Cast & Crew in Texas for some inspiration. I love checking out Jenny and Cody's shop every month as their fantastic goods are always being sold and replaced by even more fantastic goods. 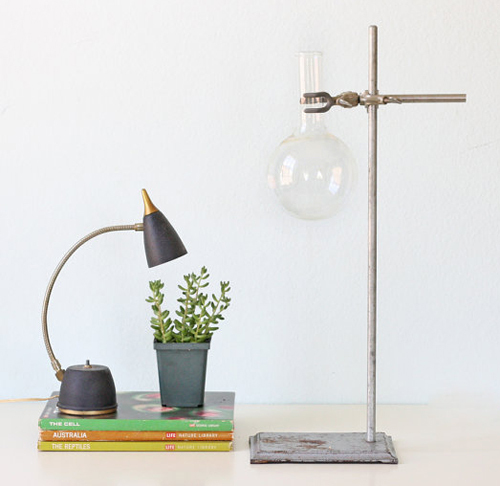 An industrial lamp is an easy get for a guy's desk and it always looks stylish. Like these two beauties above. 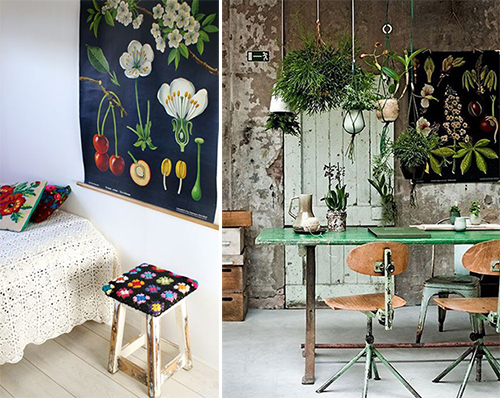 A splash of bold color in a guy's place is a great sign if you ask me. Yellow, orange, kelly green, bright red ...it's all good. It's the care for design that makes a piece special. Does it have personality? Does it have a look specific to a designer? Or just this one question- does it look great standing alone by itself?